Child proofing your windows using Kidco Mesh & Guardian Angel Window Guards helps to enhance your child’s safety whenever the windows are open. 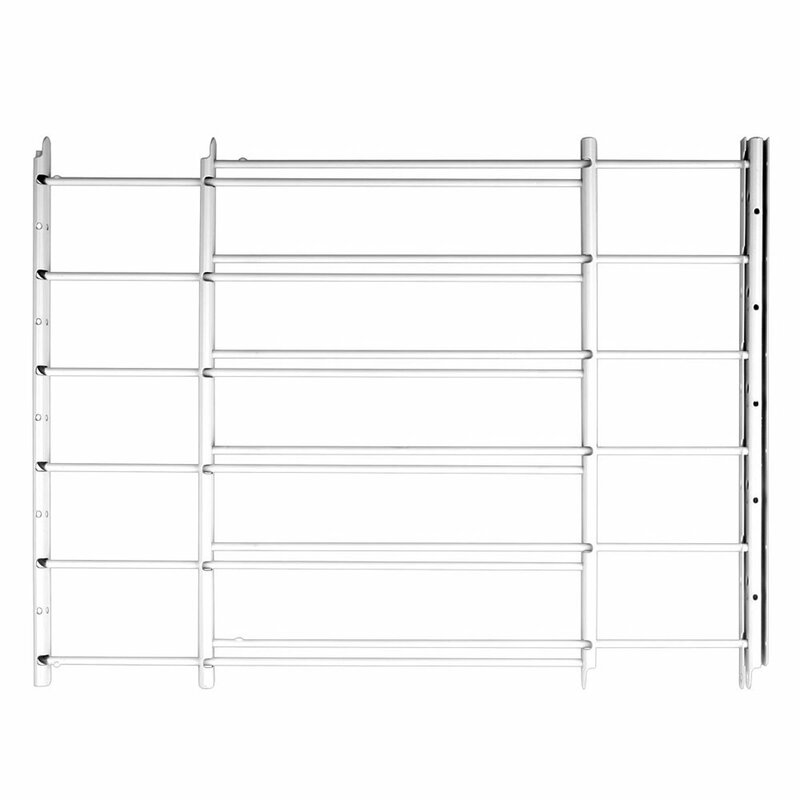 These guards are constructed of metal or aluminum material. They are fixed and mounted on the window opening in order to prevent the child from falling. Some are also made of durable mesh. In addition to baby proofing other areas such as doors, kids beds, large openings or balcony, this is another way to keep your house safe. They are designed in a way that the head of the child cannot pass through and fall. They usually help to keep your child from climbing onto the window sill. These guards should be sturdy enough to prevent your child from accidental falls. Choose those that are able to blend easily with your window design. Check for those with features that allow for quick installment and removal in case of an emergency. Ensure you have the correct measurements especially frame to frame, in order to find a size that fits well. Here are some of the best models available in the market. This guardian angel model features sturdy steel bars and is designed to mount on the window with the help of mounting screws. Some come with either 4 horizontal bars or 5 horizontal bars . It is very easy to install and remove. It does not interfere with blinds or windows. It also has a great adjustable feature. 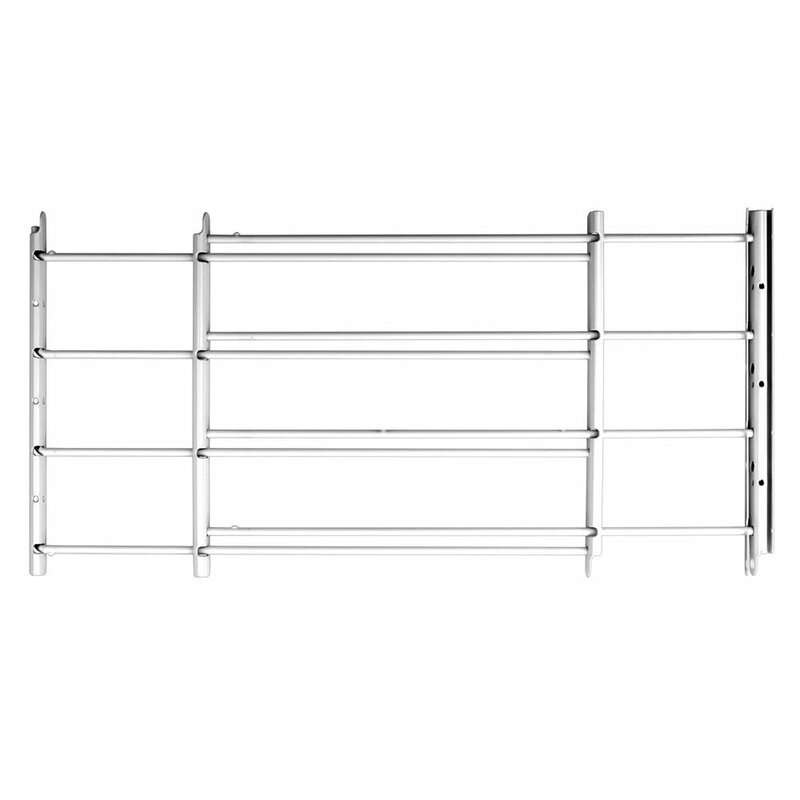 This model is available in different sizes and each of them comes with 4 release buttons so that it is possible to remove out of the way in a faster manner in case of an emergency such as fire escape. The measurement between the bars is 3.7/8 inches to prevent the baby from climbing in between those bars. It holds up to 150 lbs. of pressure. This model works well with single & double hung type of windows, plus sliding as well as hinged casement type of windows. This model features sturdy nylon mesh without any metal bars. This guard blends well with window treatments. It is designed to fit sizes ranging from 26 inches to 40 inches in width and 24 inches in height. This works well with sliding plus single & double hung windows. It is able to withstand up to 60 lbs of pressure. They are easy to install and remove. It features a quick safety latch so that it is possible to remove during an emergency. Because the mesh is see through, means that you can let the light get in and you can also see out when it is in place. The John Sterling model features powder-coated steel bars and welded heavy duty channels. They come as 3 bars, as 4 bars, as 6 bars and even as 8 bars. 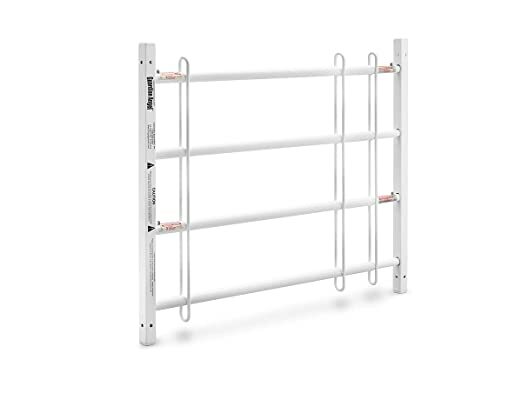 These bars are designed to fit openings measuring 24 inches to 42 inches wide but differ in height measurements. They are very easy to mount either on the side or on the front of the frame. They come with 4 mounting screws for easy fixing. They are designed to swing open for easy access during emergencies or when cleaning. 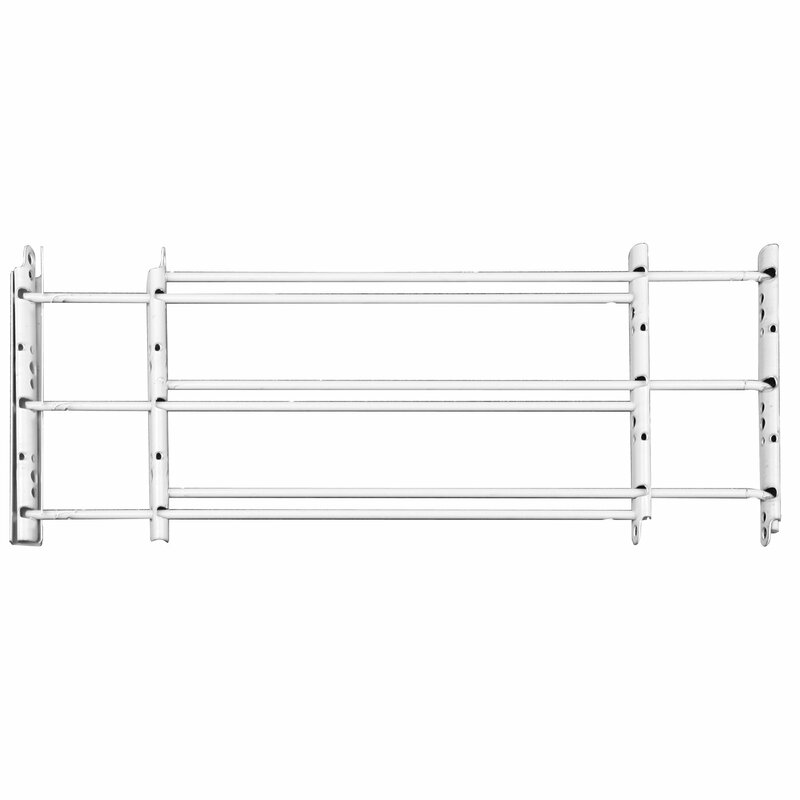 This model is great for securing your basement and garage windows and works well with awning and double hung window type. You can get the 8-bar with a max height of 32.5 inches here.Here are 3,4,& 6 bars. 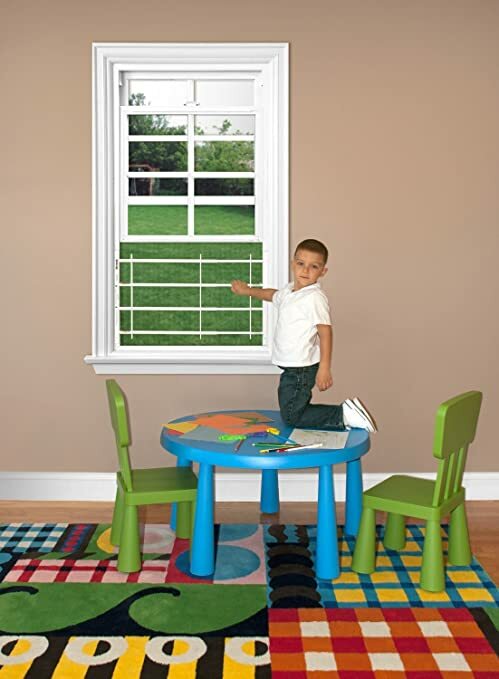 Keep your child safe by fixing one of these safety guards .Get the much-needed peace of mind and also have an opportunity to open your windows to let in fresh air in the house. Remember that you still have to watch over your child even when near the window openings.